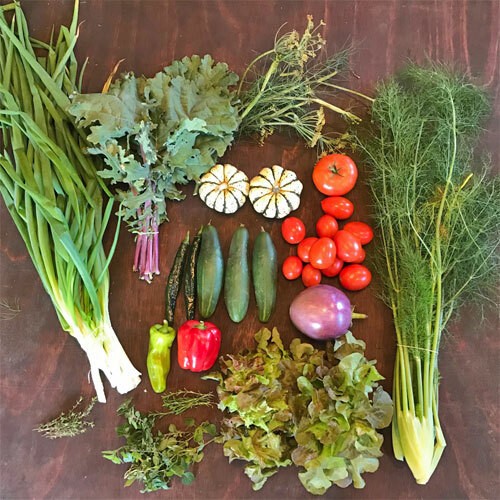 The count down to the last share is on and we are trying to figure out how to load you up with all of the goodies we have left in the garden. Our tomatoes are still going strong and we included a healthy amount of romas as well as beefsteak tomatoes this week. It feels like the weather has turned cold overnight which means everyone should stay inside and cook. We have some wonderful recipies with all of these great fall vegetables in the share this week. As always, thank you for supporting us. Skin and thinly slice 3 cucumbers. Dice 1/4 cup green onions and thinly slice 1/3 cup fennel fronds. 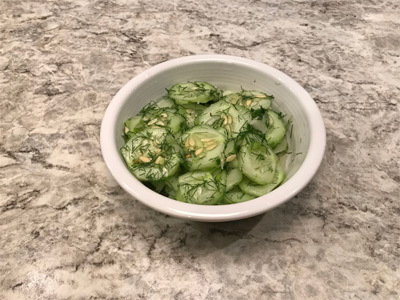 Toss cucumbers, green onions, and fennel fronds with 1/2 cup white wine vinegar, 1/2 water, 1 tsp salt, and 1/2 tsp ground black pepper. Chill, allowing flavors to blend, then serve at room temperature. 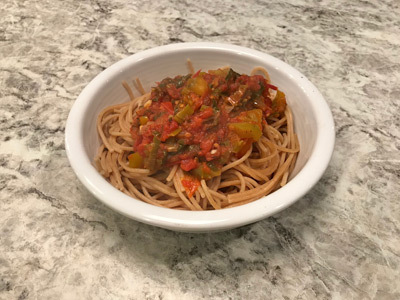 Dice 4 roma tomatoes, 1/4 cup celery, 1/4 cup bell peppers, 1/4 cup green onions, and 1 finely chopped pasilla bajio pepper. Cook celery, peppers, and green onions in 2 tbsp olive oil. Saute over medium heat for 5 minutes until vegetables are tender. Add 1 tbsp of finely chopped and mixed thyme, winter savory, and oregano, and 2 tsp finely chopped fennel seed and flower. Add 4 diced tomatoes, a 28oz can of stewed tomatoes, 2 tsp salt, and 1 tsp ground black pepper. Cook sauce until thickened, then serve over pasta. To make stir fry sauce: in a blender combine 1/2 cup olive oil, 1/2 cup green onions, 2 tbsp soy sauce, 2 tsp sesame oil, and 2 tsp sesame seeds. Quarter eggplant, then thinly slice eggplant into 1/4 inch slices. Cut 2/3 bell pepper and cubanelle pepper into thin strips. Mince 1 tsp fresh ginger. Heat wok pan over medium high heat, then add 1/2 stir fry sauce, pepper strips, and minced ginger. 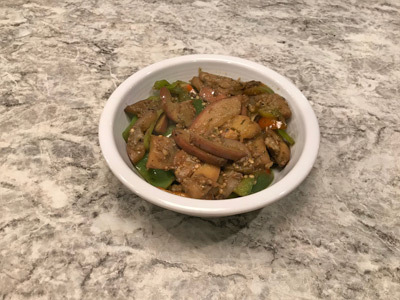 Cook stirring frequently for several minutes, then add remaining stir fry sauce and sliced eggplant. 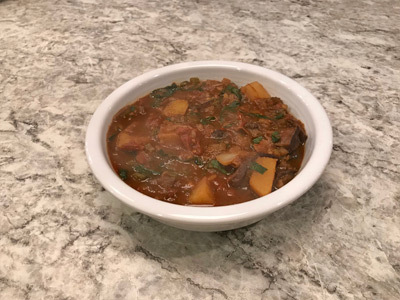 Cook for several minutes, stirring frequently, until eggplant is tender. Heat 2 sweet dumpling squash in microwave for 2 minutes, or on stovetop in 1 inch of water until tender enough to skin. Cut in half and remove seeds, pulp, and skin. Cube 3 medium russet potatoes. Finely dice 1/2 cup bunching onions, 1/2 cup celery stems and greens, 1/2 cup fennel bulb and stem, and 1 clove of garlic. In a large stock pot or Dutch oven heat 3 tbsp olive oil. Saute the diced onion, celery, fennel, and garlic over low heat for about 5 minutes until fragrant, stirring frequently. Add 1 lb of a mix of button and portobello mushrooms and 1/4 cup vegetable stock. Cook on medium high until the liquid is reduced. Add 2 tbsp of mixed and finely chopped thyme, winter savory, and oregano, and allow to cook for several minutes. Deglaze with 1/2 cup of red wine or vegetable stock. After a few minutes add 4 cubed roma tomatoes, 1 8oz can of tomato sauce, and 3 cups of vegetable broth. Add 2 celery ribs, chopped, 3 potatoes, cubed, 2 sweet dumpling squash, cubed, and 1 tbsp balsamic vinegar, salt and pepper to taste. Bring to a boil, then reduce heat and simmer for 30-40 minutes, stirring occasionally until all vegetables are tender. With 5 minutes remaining add 1/2 cup thinly ribboned kale. 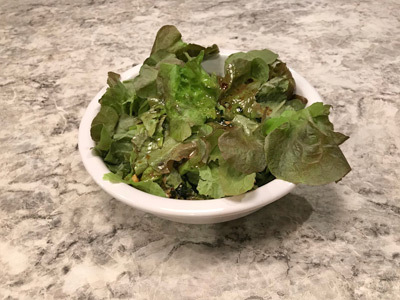 To prepare dressing- combine 1 tsp finely minced ginger, 1/2 tsp finely mince pasilla bajio pepper, 1/4 cup canola oil, 2 tbsp soy sauce, and 2 tbsp rice wine vinegar. Stir briskly.Serve dressing over leafy salad greens mix.